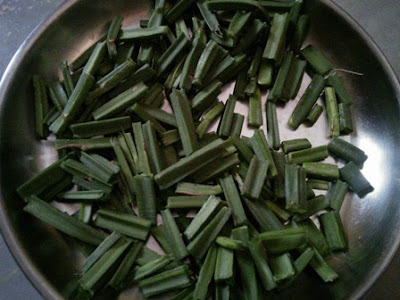 Pirandai is a creeper which has so many health benefits. Pirandai thuvaiyal is good for all digestion problems like indigestion, lack of appetite and gastritis. 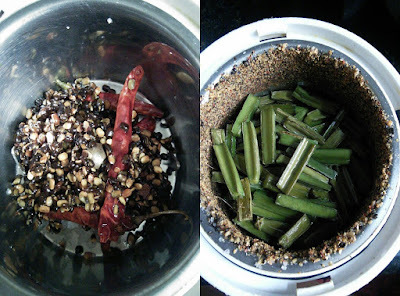 I learnt this recipe from my grandma which has a nice flavour of black urid dal. We have to add more tamarind to prevent the itching in the tongue after eating this. Wear gloves or grease your hands with sesame oil before chopping it. You can serve this thuvaiyal as an accompaniment for curd rice, idly and dosa or you can mix it with the hot rice and a tsp of ghee. Pirandai thuvaiyal - A healthy accompaniment for your everyday foods which has wonderful medicinal uses and so many health benefits. 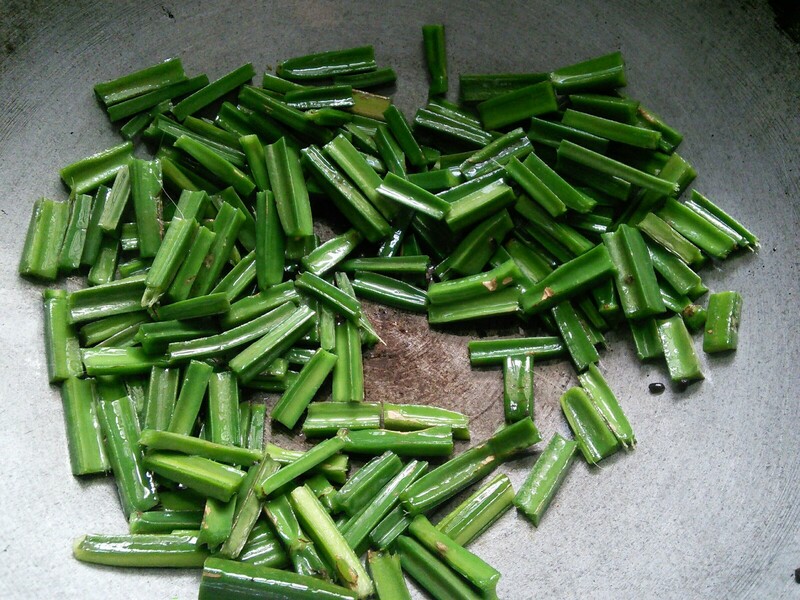 Wash and remove the leaves and nodes. Cut into small pieces. Heat a tsp of oil in a pan and add the red chillies and fry them for few seconds and then add the black urid dal, compounded asafoetodia and the tamarind. 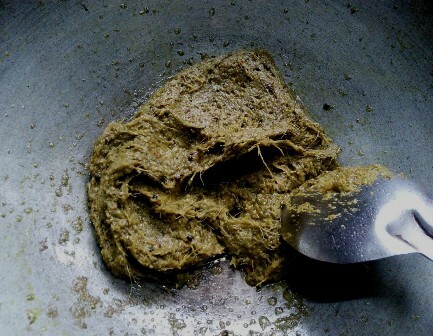 When urid dal turns golden brown transfer it to a plate. Now take the chopped pirandai in the same kadai and fry them till it changes to pale colour. Let it cool completely. Then powder the fried dal and chillies and then add the tamarind, salt and asafoetodia. Powder them first and then add the fried pirandais. Grind it to a smooth paste with little water. Heat a tbsp of oil in a pan and add mustard seeds. When it splutters add the ground thuvaiyal and stir it till oil leaves on the sides of the pan. 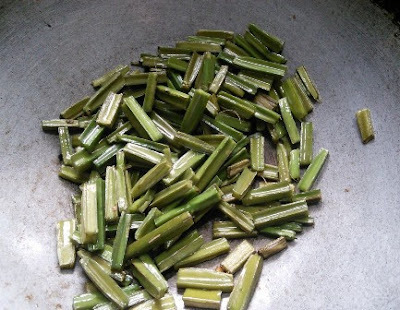 Serve it with hot rice with a tsp of ghee or sesame oil. 1. Wash and remove the leaves and nodes. Cut into small pieces. Wear gloves and then cut the pirandai. 2. Heat a tsp of oil in a pan and add the red chillies and fry them for few seconds and then add the black urid dal, compounded asafoetodia and the tamarind. When urid dal turns golden brown transfer it to a plate. 3. Now take the chopped pirandai in the same kadai and fry them till it changes to pale colour. 4. Let it cool completely. 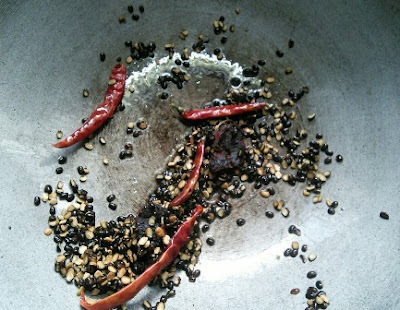 Then powder the fried dal and chillies and then add the tamarind, salt and asafoetodia. Powder them first and then add the fried pirandais. Grind it to a smooth paste with little water. 5. Heat a tbsp of oil in a pan and add mustard seeds. When it splutters add the ground thuvaiyal and stir it till oil leaves on the sides of the pan. 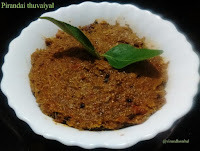 If you try this recipe for Pirandai Thuvaiyal - (Adamant Creeper Chutney) send us your comments below and share the recipe for your friends and family.